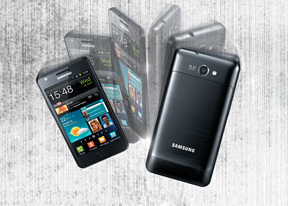 The Samsung Galaxy R runs Gingerbread 2.3.4 with the most recent TouchWiz 4.0 launcher. From a software standpoint, you’re looking at an interface almost identical to that of the Galaxy S II. Take a look at our video of the device in action. The lockscreen is the same as ever—swiping in any direction will give you access to the phone. The cool feature where missed events (messages, calls etc) get their own unlock patterns is still here too. If you prefer, you can choose List view instead of the default Grid view. In typical TouchWiz fashion, there are four shortcuts docked at the bottom of the screen that are visible both on the homescreen and in the app launcher. You can swap the first three with different ones (by default the shortcuts are Phone, Contacts, Messaging). The rightmost is the app drawer/home shortcut used to toggle between the apps menu and the homescreen, so it makes sense to always keep it in the same place. With the Samsung Galaxy R you get a standard Android task switcher but with one modification - it has a button to launch a task manager. The custom task manager which Samsung have preinstalled offers a lot of functionality. It also comes with a handy widget which shows you the number of active applications right on your homescreen. 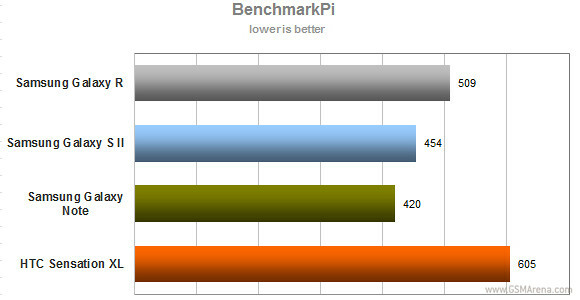 In the BenchmarkPi test, the Galaxy R does significantly better than the single-core HTC Sensation XL, even though the XL has a 500MHz advantage. 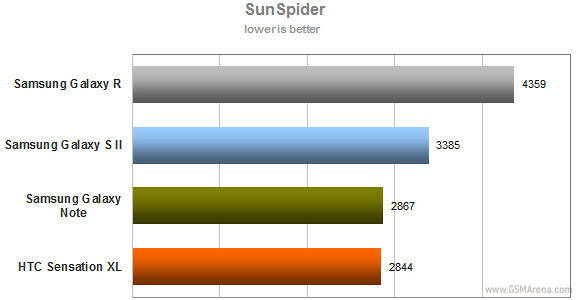 As expected, the lower-clocked dual-core 1 GHz processor of the Galaxy R underperforms compared to the faster ones in the Galaxy S II and the Galaxy Note. 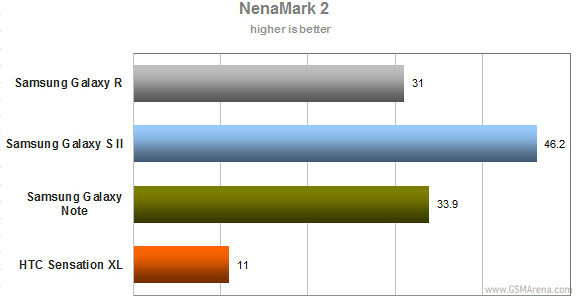 The S II and Note do better but not by much, considering they are clocked 200MHz and 400MHz higher, respectively. Linpack sees more of a drastic difference when comparing the Galaxy R to its more powerful siblings, while the Sensation XL scores marginally lower. In the 3D graphics test, the Galaxy R surprisingly manages to score just 3fps lower than the Galaxy Note. This is probably due to the dedicated GeForce GPU from Nvidia present in the Galaxy R. The Sensaton XL scores a measly 11fps, so you may consider a Galaxy if 3D gaming is your thing.